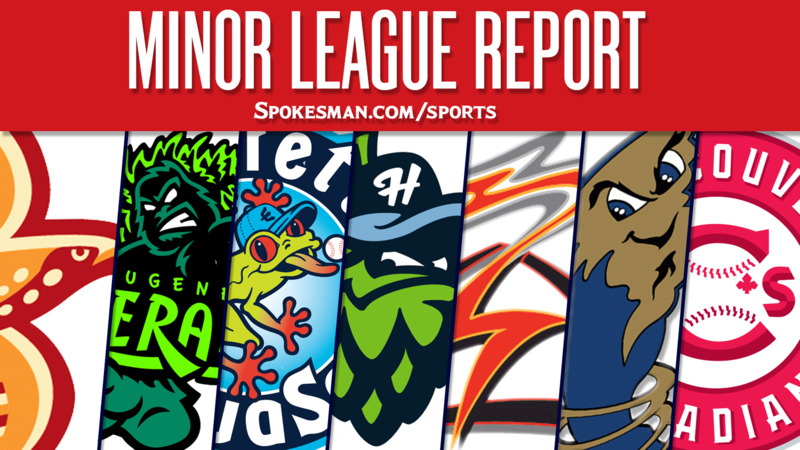 Hillsboro 8, Spokane 6: William Gorman went 4 for 4 with two runs and two RBIs and the visiting Hops (5-2) topped the Indians (4-3). Eugene 5, Vancouver 3: Grant Fennell went 2 for 4 with a two-run homer and the Emeralds (3-4) beat the visiting Canadians (4-3). Fausto Carrera (2-2) allowed one run on four hits and a walk over six innings. Salem-Keizer 8, Everett 6: Nico Giarratano hit a three-run home run and the Volcanoes (4-3) beat the AquaSox (3-4). Jose Layer and David Villar added solo shots while Robinson Medrano went 3 for 4 with three RBIs for S-K. Cal Raleigh and Nick Rodriguez had three-hit nights for Everett. Boise 11, Tri-City 10: Willie MacIver hit a two-run homer in the seventh inning and the Hawks (2-5) edged the visiting Dust Devils (3-4). MacIver went 2 for 4 with two runs and three RBIs whiel Terrin Vavra added a solo homer and went 2 for 5 for Boise. TC’s Cole Bellinger was hammered for eight earned runs in two innings. Reno 3, Round Rock (AAA) 2: Former Texas Rangers pitcher Neftali Feliz allowed two runs over six innings with five strikeouts and the visiting Aces (55-53) beat the Express (51-53). Hanser Alberto and Drew Robinson drove in runs for Round Rock. Midland 7, Frisco (AA) 2: Parker Dunshee allowed tow runs on five hits over seven innings and the RockHounds (47-60) beat the visiting RoughRiders (45-63). Luis Yander La O and Destin Hood drove in runs for Frisco. Hickory (Low-A) 7, Charleston 3: Pedro Gonzalez went 3 for 4 with a three-run homer, his 11th, and the Crawdads (52-54) beat the RiverDogs (50-54). Ryan Dorow and Kole Enright added three hits apiece for Hickory. Published: July 31, 2018, 5:55 a.m.